If you are looking for a gourmet hot spot in Boca without nightmarish traffic jams, then Little Brazil located on Glades Road just west of the Florida Turnpike offers both peerless cuisine and a stunning ambiance. No waiting for the phantom valet, no downtown crush - just endless parking only a few feet from the front door. You can devote all your energies to savoring the truly extraordinary food and service of an accomplished Brazilian staff. The fare is all about incomparable balanced creations delivered with supreme freshness and a range of intense flavors. The vibrant interior with its beautifully textured brick walls, dynamically pattered booths and manicured tables provides a thrilling backdrop for that perfect lunch or the dinner gathering of friends and family. Another positive that will garner praise is the cluster of engaging, extremely well informed staffers who adroitly balance professionalism and charm. The select wine list draws heavily on premium vintages from Europe and South America as well as a sampling of distinctive California labels. A number of varietals are available by the glass. The majestic bar offers numerous premium beers on tap as well as in bottles. Happy Hour (available between 4 to 7 pm, Mon-Fri) features reduced priced drinks as well as discounted delicacies. The menu draws upon intensive research and imaginative touches garnered from the major regions of Brazil. 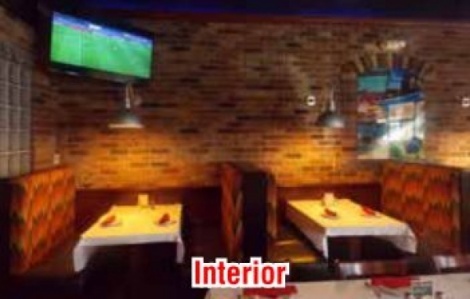 Refinements were then added by the staff of the first Little Brazil which has been functioning in Miami since 2009. For example, the skillful orchestration of cod and select spices rendered the quartet of the Bolinho de Bacalhau ($8.95) an inspired opener. Linguica Frita com Mandioca ($9.95), prepared with a fragrant Brazilian sausage, sautéed onions and yucca (which is like potatoes, but only better ) is another peerless starter. The mains are equally inspired ranging from signature fish, beef and chicken dishes to superlative salad creations and tantalizing pasta specialties. Picanha ($19.95) is an incredibly flavorful presentation of tender cuts of sirloin grilled with roasted garlic and served with a superlative vinaigrette, seasoned farofa, ethereal rice and scrumptious beans. Paella ($24.95) is an unparalleled rendition of this seafood favorite. An abundance of shrimp, mussels, clams, calamari, scallops and filet is tossed in a magnificently fragrant saffron rice. It doesn’t get any better than this. We finished with the luxurious and brilliantly executed Petit Gateau ($8.99), a luscious lava cake served with vanilla ice cream. The Pudim de Leite ($5.95) is an extremely addictive Brazilian flan that will leave you breathless. For more menu options, delivery and catering visit www.littlebrazilmiami.com/Home/Menu.